Sailing on a Balboa Island Co. ferry, commissioners discussed local maritime policies and harbor landmarks. 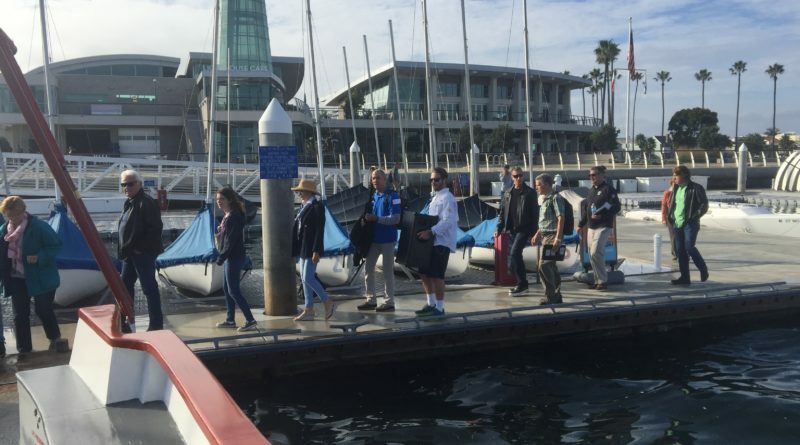 NEWPORT BEACH—Local residents, news reporters and Newport Beach city staff filled the event room at Marina Park Community Center for an informative ferry tour presented by the city’s harbor commission. Commissioners briefly took public comments before a 15-minute recess for passengers to board the ferry. Much of the presentation was a recap of how the harbor commissioner’s feedback has been an integral part of local maritime policymaking and also what has changed in Newport Beach over the past year. After Commissioner Paul Blank introduced the harbor commission, Commissioner William Kenney discussed the six areas of focus: dredging, harbor operation and management, amenities, codes and regulations, commercial and educational opportunities, and the harbor’s vision for the future. Many attendees were curious about the process of updating Title 17, the municipal code governing harbor activities and regulations. One recent amendment was the rule change allowing for speed limit exceptions on city waters during sailing regattas. Another example was forging the new harbor department, which will put an emphasis on customer service needs, budget changes and code enforcement. Commissioner John Drayton reminded passengers, “There is full public participation in anything we do,” regarding major updates to Title 17. Kenney revisited one of the more bizarre events that has plagued Newport Beach: bridge jumping. This past summer, The Log covered the case of a young man who jumped onto a Duffy boat from Lido Bridge, resulting in the injury of a female passenger. Kenney said that in addition to this dangerous stunt, another group of bridge jumpers had aimed to set a Guinness World Record for “most bridge jumpers” in the city. The harbor commission is still deciding how to stop bridge-jumping incidents. Commissioner Ira Beer touched on the topic of mooring size regulations, which has been covered extensively, and the issue at J Field concerning commercial and derelict vessels that are stored there. Beer said that vessel storage has been one of the foremost complaints and a process to consolidate the vessels is in the pipelines. Commissioner Scott Cunningham presented the topic of dredging. “Chris Miller [Newport Beach harbor resources manager] calls [this process] the “Achilles heel” of the harbor,” Cunningham said. Drayton later commented that dredging costs might be lowered by implementing a procedure that would allow harbor staff to dredge 365 days a year and sideline the current permit policy. Dredging Grand Canal was cited as an example of costs “getting awfully expensive” as the narrow waterway was approved for a rebid of nearly $1.4 million. Newcomer to the agency Commissioner Don Yahn gave an explanation of Title 17, marine activities permits (MAPs), wastewater discharge and commented on liveaboards in the harbor. There was certainly a recreational boating crowd, but some people were newcomers. The harbor tour takes place during even-numbered years and does not accrue costs from the city for the free boat trip.